Stop. Thinking about yesterday. Stop. It is long gone. Or, as it tuns out, loving you was the right thing to do. Not that it stopped Fleetwood Mac and I from breaking up. 1998. The way I remember it, I had enough. That recurring theme: Too much of a good thing. The Empire Strikes Again. Back. Lesson learned. Never say never (again). Or, don’t give away your Fleetwood Mac collection just because you think you have played it into the ground. At times like this (when you may not be thinking straight), distance is your best friend, your only friend. The satisfaction of fitting an entire life inside a car requires honest assessments. LPs are obviously too big in The Freedom Express, but CDs are not exactly invisible. Trimming the fat can lead to hasty decisions. Hasty decisions are off-ramps to regrets. Everyone. Everything I know, goes away, in the end. But wait. Will we be afforded a happy ending? Fifteen years later, we are reunited. I’m getting the band back together (I actually bought the entire Fleetwood Mac collection again). I know, I know, even in this economy. Money in, money out. Stupid recurring themes. I had to. It was more than just a craving. You can get a quick fix hearing the hits on the radio. But a song here and there doesn’t cut it. You need “Second Hand News” to lead into “Dreams” into “Never Go Back Again.” So that you can properly go back again. 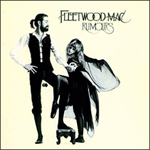 Rumours was a perfect storm, an album embedded in the complicated circumstance of rich histories diverging and fronts colliding, then chronicled perfectly, with beautiful precision and craftsmanship. And you were okay giving all this away. So, I admit it. I was wrong. I was an idiot (again). Good enough? I am just thankful we are back together. Even better than I remember which says a lot because, really, the way I remember it, you were perfect. I won’t let go again. Promise, I said (or thought to say anyway).